Philosophers of science (and scientists, and science journalists, teachers, etc.) like vivid examples of sciencey things happening that illustrate various scientific or philosophical concepts. Examples that make you gasp or chuckle or compulsively send the link to everyone in your contacts list. Most philosophers have a list of such examples that they carry around in their mental back-pocket and pull out to explain their research to non-philosophers, impress people on airplanes, and win bar bets. So I have my own list. Stained-glass-is-nanoscience is way up there, and so is how nanomaterials can be used to cure cancer. There is a special subset of back-pocket examples that I think of as “Awesome Science Terrible For Humans.” Top biller here is probably nuclear weapons testing. But there are a lot of others; they are the stories that make you go “NEAT!” and then feel like a bad person for thinking something so destructive could be just utterly fascinating. “ASTFH” cases are useful because they are gripping both in talking and writing settings. When something is terrible, it is easier to see why one might want to do something about it; it’s the difference between knowing that malnutrition is a global-crisis issue and walking by someone who is starving and asking for help. 3. How radium gets in the body: After Marie Curie discovered radium, people were excited to put it everywhere. In their watch dials, in their water. Radium spas became the new “it” getaway vacation. Radium paint became an invaluable asset in the trenches of World War 1. And the women who worked in factories that painted watch dials and other instruments of war with radium would dip their brushes on their tongues to keep the bristles moistened and sticking together. Everyone knows the macroscopic story: radium made their teeth and hair fall out, made them lose weight (hence radium spas), made their bones so brittle they couldn’t walk. But the reason radium was so effective at destroying people from the inside out isn’t just because of radioactive decay. It is also because of the periodic table: radium is a Group 2 metal, an alkaline earth. Which means it has the same outer electronic structure as all the other alkaline earth metals, including calcium. This electronic similarity is a disguise of sorts, allowing radium to enter the body by the same channels that calcium usually makes its way it. It’s kind of like when the old cartoon skunk, Pepe le Pew, is tricked into thinking a pretty cat is a skunk like him because the cat has accidentally walked through paint. And this is a really neat (terrible) stunt that radium can pull off. Then, of course, it gets into the calcium channels and “takes off its mask.” It starts radioactively decaying and basically bull-in-a-China-shop-ing any nearby cellular structures, leading to cell death and, if enough cells die in the right (wrong) places, human death. Bonus: If we only tell bottom-up stories about the structures of atoms and molecules, we would start with the difference between radium’s nucleus and calcium’s nucleus, not the similarity in their outer electronic structures, and we wouldn’t get a good explanation of why radium so easily travels along calcium uptake channels. So, yay anti-reductionism. 2. Thalidomide: Thalidomide is a chiral molecule that gave a generation of children birth defects. It was first received on the market as a wonder drug, a sedative that also alleviated stomach issues. So it was given to pregnant mothers to ease morning sickness throughout the early 1960s. Now, thalidomide has two enantiomers, two ways of arranging itself that are not superimposable on one another–like how we have right and left hands. It turns out that one enantiomer is responsible for all the palliative effects that users experienced. The other enantiomer prevented proper development of fetuses and resulted in really horrific disfigurements of limbs of children whose mothers took the drug during the first three months of pregnancy. This case is fun because not only is it a good illustration of anti-reductionism (lists of atomic makeup are not sufficient to describe the structure and properties of the chemical), but also the story of how thalidomide got approved for, and then pulled from, commercial markets is a gripping case for beginning conversations about bioethics and science in society. 1. De Havilland Comet: Okay, check this out. The first commercial jetliners had square windows. The sharp corners of those windows caused massive amounts of metal fatigue, which increased with changes in pressure and temperature as the jets took to the air. The result? The metal body panels of the planes sheared into pieces, looking like a giant tiger had run its claws down the length of the plane, and causing the planes to depressurize, lose their aerodynamic design, crash, and of course, kill lots of people. The continuum models of metals that were being used to design the planes failed to account for corner-based metal fatigue, which is a phenomenon explicable only by structural (i.e. not continuum) models. Well, it turns out most of my examples are pretty chemical. No surprise there. But I am so, so curious what other episodes of Awesome Science Terrible for Humans show up in other areas of science. Please share in the comments! In many explanations, especially in chemistry, natural laws play a role akin to the role played by the resurrection of Jesus in many American Easter rituals. The resurrection (be it truth or convenient fiction) inspires the whole to-do and is essential to the celebration, but its presence is only vaguely felt among the chocolate bunnies and brightly-colored plastic eggs. And while the appearance of matzah in sandwich shops can be explained by a quick cross-reference between the Gospels and the book of Exodus, it takes a bit of creative storytelling to make the connection between the crucifixion and baskets full of artificial plastic grass. Most accounts of explanation—even the mechanistic ones that purport not to emphasize the role of natural laws as explanantia—have overlooked this distinction between what is essential to an explanation and what does the work of explaining, leading to theories of explanation that look like Latin masses: the laws are center-stage, but the what is being said is far enough removed from the day-to-day activities of science that it sounds like a different language altogether. One of the ways that we learn about ourselves and others from a young age is by comparing favorite things. From favorite colors and shapes to favorite movies and songs, sharing favorites is one of the ways that people get to know each other. It’s a form of small talk that can give rise to friendly, social-identification-improving teasing. And it is open-ended enough that games of “What’s your favorite [x]?” can go on for hours or months without exhaustion. When I started college, I learned that architecture was a thing you could go to college to study. I’d never really thought about where buildings came from before. But my undergraduate university has one of the best architecture schools in the country, and so I got to play what’s-your-favorite with a bunch of aspiring architects. I learned from them that one of the categories of favorite things people can have is buildings. Mine is La Sagrada Familia. La Sagrada Familia cathedral is Antoni Gaudi’s magnum opus. A naturalistic reinterpretation of Gothic architecture, the cathedral teems with arches and flying buttresses, gargoyles and towers. Like many classical Gothic masterpieces, La Sagrada Familia features a rose window: a circular stained-glass window divided by stone into wedge-shaped panes, like the petals of a flower. But unlike the intricate filigree work that fills rose windows in classical Gothic architecture, the panes of Sagrada’s rose window are irregular, geometric blocks of color, inspired by the cubist movement that took root in Spain at the same time as the cathedral. 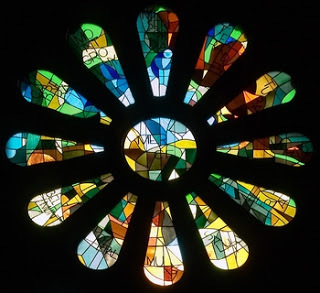 La Sagrada’s rose window is dominated by blues and greens in a variety of shades and hues. Cubist painters would have tried to depict the window with pigment-based paints, turning especially to ultramarine pigments derived from ground up lapis lazuli and to copper(II) acetoarsenite, or Paris green. They might have tried to overlay these paints with reflective glosses or undercoat their canvases with special primers to capture the otherworldly glow of the colors in the window’s stained glass. But their paintings would never have done the rose window justice, because the colors in the stained glass do not come from pigments or dyes. Where pigments and dyes produce color by selectively absorbing light at certain frequencies, the colors in La Sagrada’s window are produced by localized surface plasmon resonance, that is, the collective, resonant oscillation of electrons on the surface of a nanomaterial in a conducting medium. Localized surface plasmon resonance (LSPR) occurs when a solution of nanoparticles, such as a glass doped with finely divided metals, is stimulated by electrons or photons of a particular frequency. LSPR is a scale-dependent material behavior, one that can only occur in nanoscale materials. While LSPR has played a role in color technology throughout the ages, it has only come to be understood as a physical phenomenon in the past three decades. Today, scientists are particularly interested in developing nanomaterials with finely-tuned LSPR responses—that is, intense resonances in response to a narrow range of stimulus frequencies. The recent surge of scientific interest of scale-dependent material behaviors like LSPR raises a variety of philosophical questions, from ontological puzzles about color classification and material identity to ethical concerns about the safety of nanomaterials and epistemological and methodological worries about how to reason about a domain of inquiry that is specified by a length scale rather than a set of common material properties or biological functions. My dissertation answers three interrelated questions of the latter sort. My main goal is to answer the question How are theories and models used to reason about nanomaterials? To answer this question, I demonstrate that there are differences between the ways in which scientists use theories and models to reason about nanomaterials and the uses of theories and models that philosophers of science have identified up to this point. I highlight these differences by answering two further questions: 1) How do scientists respond to new modeling challenges that arise as a consequence of scale-dependent material behaviors? and 2) How do theories and models help scientists synthesize nanomaterials? These two questions cannot be answered independently of one another. I argue that in order to gain synthetic control over nanomaterials, scientists need to be able to model the behavior of nanomaterials at multiple scales (microscopic, mesoscopic, and macroscopic), because different, interdependent behaviors of interest occur at different scales. I demonstrate that in designing nanomaterials, scientists use models and theories to achieve a balance of desirable features that trades off between behaviors at different scales. I argue that this balance is best achieved by a particular kind of non-reductive account of relations between models at different scales. I call this the model interaction account of theory and model use. I demonstrate that novel, scale-dependent material behaviors like LSPR are not modeled solely by top-down nor by bottom-up methods. Instead, the two approaches are combined and adapted in order to, e.g., describe LSPR and synthesize materials that exhibit LSPR behaviors. Drawing on Wilson’s “theory facade” account of concepts and theory structure in the physical sciences, I argue that concepts central to nanoscience, such as surface, change meaning between the macroscale and the nanoscale, and that model interaction is required not only to address synthetic challenges but also to develop conceptual understanding of surface and related scale-dependent concepts. I wish I knew how to code LaTeX tables into WordPress interfaces. Tuning is the use of theories and models to produce a desired effect, such as a substance with specified properties or a bridge that will bear a certain amount of weight and stand up to a certain amount of wind. It is a design-oriented, engineering methodology, and it plays a central role in scientific research. Philosophers of science have largely overlooked tuning, and I have written elsewhere about why this happens and why it is a problem. For now, here is a fun piece of internet-scavenging: I have diligently researched* some Facts about the use of the word “tuning” in scientific articles published in 2013. “Tuning” shows up in over 15,000 articles in each of chemistry, nano, materials sciences, physics, and biology. It shows up over 10,000 times in neuroscience and medicine. “Tuning” appears almost as often as “explanation” in biology, neuroscience, chemistry, and physics. It shows up more often than “explanation” in nano and materials science. It does not show up as often in climate science, geology, psychiatry, psychology, or cognitive science. My current paper is about theory and model use in tuning, comparing and contrasting tuning uses with explanatory, predictive or descriptive uses of theories and models. It is sometimes worth making the point that tuning is kind of a big deal and it is, therefore, extra weird that philosophers haven’t taken it up as whole-heartedly as explanation. Due diligence disclaimer 1: Of course there are philosophers who have thought about tuning in some form or another. e.g. Mark Wilson, Ian Hacking, the design problems and philosophy of engineering crowds. Woodward and the mechanisms crew have language to talk about tuning in terms of lever-wiggling, but it doesn’t often become the subject of their discussions. Welcome to the Wednesday link-dump, brought to you by the question that kept coming up over and over this past week in Pittsburgh and New York: How can philosophy make a difference? On Saturday, some of the editors at The American Reader talked with me about the inheritance of this question from a continental-philosophy perspective. The great experiment and great failure of Marx, and the idea that ideas can change the world, etc. I rehearsed for them some of the areas of philosophy of science that are known for finding some social engagement–bioethics, science and values–and we discussed the relationship between Science and Technology Studies and philosophy of science. We took the fact that they knew Bruno Latour’s name as evidence of the relatively wider reach of his ideas than some of the ideas I suggested (the no-miracles argument, confirmation theory), and spent a while ruminating on the tradeoffs between rigor and accessibility. It has always struck me as a sorrow of our field that the demands for rigor can make the ideas somewhat less tractable to broad audiences, and I admire people like J.D. Trout who can transcend that tension. Then what should I find in my inbox Sunday morning but an article about the Public Philosophy Journal, a new collaborative project by groups at Penn State and Michigan State. While the project presents itself as more about creating a journal with collaborative, social-media methods than a journal aimed at publicly-minded content, both projects seem to be on the horizon. So I signed up for the listserv, and maybe you should too. It will be exciting to see how it develops! Speaking of listservs, I manage the listserv for JCSEPHS (the Joint Caucus for Socially Engaged Philosophy and History of Science), a new group of philosophers and historians of science who are interested in doing socially engaged research, which I believe includes figuring out exactly what “socially engaged” means. The Caucus met at November’s Philosophy of Science Association/History of Science Society conference in San Diego, and while I couldn’t attend the meeting, I heard they are interested in involving philosophers and historians of science in policy decisions, among other things. Good idea. The listserv is so new, in fact, that there haven’t been any discussions on it yet–please pardon the administrative timeline! There should be discussion starting on the listserv in the next month or two; if you want to sign up in time to catch all the action, click here. Bringing things back to nano (because come on, I made it five whole paragraphs without referring to a length scale, you can’t honestly expect six), I had a wonderful conversation with the tech journalist Chris Baraniuk on Thursday about the prospects for nanoscience/nanotechnology and the potential role for philosophy in those prospects. AKA My Favorite Thing To Talk To Strangers About. You all know the drill by now if you’ve been following along: nano’s theories are underdeveloped, and philosophers of science have the needed expertise in analysis of concepts and methodology in order to help solve conceptual, modeling, and other theoretical conundra. We also talked about his recent Atlantic article about phone phreaking and the methodology of hackers/phreakers as an instance of multiple realizability. Which was super fun and informative. Sunday night I saw a very different use of philosophy as a tool for change. Ross Perlin and the Ways of Being Together project put on a real, live language-games seminar-party-improv-night-event that would have made Wittgenstein proud. Yes, obviously it was in Brooklyn. The premise of WOBT is to put a bunch of people in a room and make them interact in somewhat novel and/or uncomfortable ways. In other words, they are trying to catalyze new kinds of reactions among and between attendees. (What? This is a philosophy of chemistry blog.) Ross’s idea was to bring to the foreground a variety of elements of our linguistic background. So we played language games and I found myself cursing a friend, then confessing to a stranger, then begging a very uncomfortable girl to give me her glasses. And we made up words, and guessed at the meaning of speech we didn’t understand, and slowly had our grammar stripped away as we talked about death. The whole experience of live-action philosophy of language seems like a great teaching tool, and a way of using philosophy (rather than mentioning it) in order to force more thoughtful and effective communication between strangers, coworkers, or classmates. It’d be more interesting than trust falls, anyway. Which brings me around to a job title I would like to have someday: Philosophical Consultant. Between Ross’s project and JCSEPHS and my continued work with the Millstone Lab on epistemic kinks in nanosynthesis, I think it’s beyond time to recognize that one of the better ways philosophy of science might make a difference is by simply making itself available to science as a problem-solving strategy, in the form of people whose job it is to recognize improper inferences, problematic inconsistencies, or other methodological and epistemic gaps in the design of theories and experiments. Yeah, it’s a pipe dream and no, I wouldn’t give up teaching to do it, but wouldn’t both scientists and philosophers benefit greatly from a formalized interaction of that sort? After all, Scientific Advisor to The Stars is a much less plausible job title, and it’s already out there. Those of you following my interest in nano know that surface-to-volume ratios keep popping up all over the place, both as an explanation for novel phenomena only witnessed at the nano scale and as one of the main hindrances to stability in nanoscale systems. These issues, it turns out, are not just issues for nanosynthesis, which is pretty exciting when you think about it: what other scientific systems can be understood in terms of the struggle to maximize surface-to-volume ratios? What can we learn from studying systems in this way? What ways of understanding how theories work can promote insights of this sort, and what ways might inhibit that understanding? On a related note, the new HBO documentary series The Weight of a Nation, which investigates research into obesity in a variety of modalities, makes the point in its first episode that the human body is designed to bear loads of a particular size. Above that scale bodily processes strain and weaken: joints ache, the liver freaks out, and of course there’s the diabeetus. Aligning a system with the scale at which it best functions, it seems, can save lives as well as provide insights of scientific and philosophical interest about the various constraints on a system’s behavior.